Mighty Clean is a certified Carpet Cleaning Reston VA Company in Northern VA. Our Carpet and Upholstery Cleaning process is guaranteed to remove more soil and bacteria than other methods. Our Reston Carpet Cleaning customers trust Mighty Clean to deliver an outstanding cleaning with no returning spots or stains. We clean residential and commercial carpets, so call today for a free estimate for your home or office carpet. When you decide to hire a professional carpet cleaner, how do you avoid companies unethical companies who sometimes do more harm than good? Why Reston residents look to Mighty Clean for their Residential and Commercial Carpet Cleaning needs! When you call Mighty Clean Carpet Care serving Reston VA, you don’t just get some guy with cleaning equipment. Our courteous and professional carpet cleaning technicians go through extensive training to learn the chemistry behind the solutions they use. Technicians are certified by the I.I.C.R.C. and trained to ensure they know the most effective ways to remove soils, tough stains, and protect your carpets to ensure they last for years to come. Our carpet cleaning system utilizes a truckmounted unit that delivers powerful suction. Using the Hot Water Extraction method recommended by the major carpet manufacturers including Shaw Industries. Just as the best method for cleaning clothes requires hot water, detergent, and agitation, so does cleaning your carpets. Our guarantee to Reston clients is that you will be satisfied the first time every time. If you’re not completely satisfied with the results following your cleaning, we’ll return to clean any areas of concern at no cost to you. If for whatever reason your still not totally satisfied we’ll refund your money no questions asked. Dirty dingy office carpets? We clean commercial carpets in office buildings, restaurants, gyms, club houses and all other types of carpets. Get a no obligation commercial carpet cleaning estimate and free demo for your company today! Reston is in Fairfax County, Virginia, United States, within the Washington, D.C. metropolitan area. The population was 56,407 at the 2000 census. An internationally known planned community, it was built with the goal of revolutionizing post-World War II concepts of land use and residential/corporate development in American suburbia. 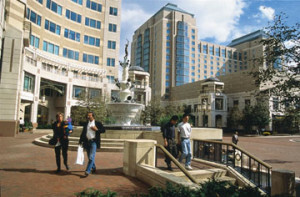 The Reston Town Center is the de facto central business district, with high-rise and low-rise commercial buildings that are home to shops, restaurants, offices, a cinema, and a hotel. It comprises over 1,000,000 square feet (93,000 m2) of office space. Reston was conceived as a planned community by Robert E. Simon. Founded on April 20, 1964 (Simon’s 50th birthday) and named for his initials, it was the first modern, post-war planned community in America, sparking a revival of the new town concept. Simon’s family had recently sold Carnegie Hall, and Simon used the funds to create Reston. Simon hired Conklin Rossant Architects as master planners to incorporate higher density housing to conserve open space, as well as mixed use areas for industry, business, recreation, education, and housing. 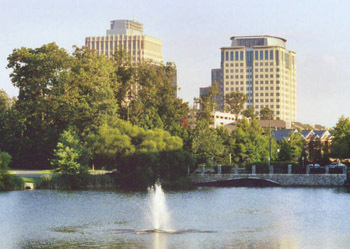 The first section of the community to be built, Lake Anne Plaza, was designed by James Rossant (who studied under Walter Gropius at Harvard University’s Graduate School of Design) to emulate the Italian coastal town of Portofino. Lake Anne village was designed with modern architectural themes that extend to a nearby elementary school, a gasoline station, and two churches. Lake Anne also has an art gallery, several restaurants, the Reston Historic Trust Museum, shops, and a senior citizens’ fellowship house. Pathways, combined with bridges and tunnels, help to separate pedestrians from vehicular traffic and increase safety at certain street crossings. Reston was built in wooded areas of oak, maple, sycamore, and Virginia pine.